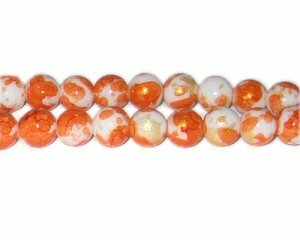 These are 10mm Orange GoldLeaf-Style Glass Bead, approx. 21 beads on an 8" string. I am very very pleased with the service and quality of all the products i have received, and at a very reasonable price. The beads and crystals are just beautiful. I really like the grab too. I'll be a returning customer. Thanks so much!